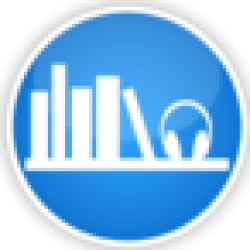 ABR's full The Hidden Masters of Marandur audiobook review and many others can be found at Audiobook Reviewer. 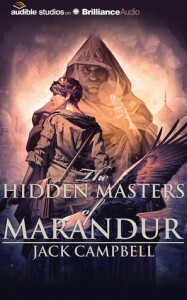 The Hidden Masters of Marandur is the second book in an epic science fiction young adult fantasy series. Please listen to the first book as there may be spoilers here. Here we are rejoined with our favorite Mage and Mechanic only a few months after we left them in the first book. In pure Campbell style we get huge action and tension right away. Then the next third of the book is nothing but Alain and Mari reconnecting, exploring their feelings for one another and battling the internal and external conflicts with their relationship. Slowly Mari puts together what she must do, while it seems everyone wants her dead, and Alain follows to protect her. They are able to find members of their guilds that are willing to help them along their journey to discovering the truth. Secrets that have been hidden for so long there is almost no one left that knows what the truth really is. While there was only one or two more very exciting scenes. This book was almost nothing but Campbell crafting an intricate spiderweb of a story. Fleshing out many of the future players and exploring what once was. Making my mouth water for the next installment. Once again and no surprise, MacLoed Andrews delivers a stellar performance. He had many characters to deal with, yet somehow he managed to give every single one of them their own voice. Using different vocal ranges and accents to make it easy for the listener to differentiate them all with ease. This still time to get engulfed by this series before you feel like you will never catch up to the current book. If you enjoy young adult fantasy, you will not be disappointed.